Anyone who reads this blog or has liked my page on Facebook knows that there are two food loves in my life. I just can’t help myself. They are so delicious and now, I have a way to indulge in both, at the same time and eat “healthy-ish”. I have married my two loves and now, I present you with Taco Pizza! 1 package of taco seasoning or a homemade blend. 1/4 cup of taco sauce + 2 tbs of taco sauce for the top. 2 cups of shredded lettuce. 3 – 4 tbs of sour cream. a few diced green onions and/or whatever else you would like on your “tacos”. Peppers are a nice addition. This recipe will make 2 pizzas, so if you only need one, half the recipe or make the whole “sauce recipe” and refrigerate half for later. Brown the ground meat until fully cooked. Once fully browned, add in the taco seasoning and 1/4 cup water, simmer it for a couple of minutes. Next, add the can of refried beans and the 1/4 cup of taco sauce. Mix together until full combined and simmer for a couple of minutes. Spoon half of the “sauce” on to one pizza crust and smooth out. Do the same with the other half on the other crust. Sprinkle 1/2 a cup of shredded cheese onto each pizza. Bake at 425 degrees for 15 – 18 minutes. When the pizzas come out, top them with lettuce, tomato, green onions and dollops of sour cream. 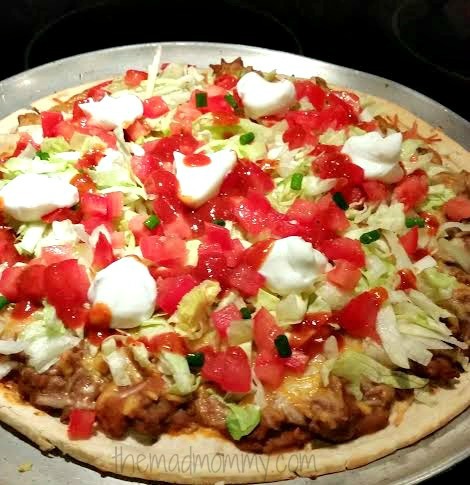 Finish off the taco pizzas with a drizzle of taco sauce on top! Have you ever seen a more mouth-watering sight? Do you love tacos and pizza? I love this. It combines two of my favorite things in one – pizza and Mexican food. I definitely need to try this. Two of my favorites too and believe me, it is delicious! YUM! This looks delicious. I wish my kids liked tacos. (How do you not like tacos!?) I’ll have to save it for a night when they’re not here…. so maybe I’ll make it in 18 years, lol. Hahaha! Make it anyway! Maybe they’ll like taco pizza! This will be a delicious addition! Hi there! Visiting from an Alexa thread from http://www.bitesforbabies.com. I love this idea…just brilliant! My kids love nachos and they love pizza but I’ve never thought of putting the two of them together. This looks delicious and so fun to eat! It’s such a delicious combination! I am completely in love with Taco Pizza now. OMG! Such a fantastic idea – it makes me want to give it a try anytime soon. Pizzas are always perfect to eat with a bunch of people – yummy, fun and enjoyable at every bite! Pizza is always delicious and the combination of taco on a pizza is a total win! It is so good! Make it sometime! There can never be anything wrong with the world when the words “taco” and “pizza” are put together. WIN! Seriously! You feel me! It is so freaking good! We must be sisters. I would love to try this out and will have to create this cheat meal one day this week. Thanks for the recipe. My kids would love this considering all they will eat is quesadillas and pizza! Awesome idea! As I said before this looks AMAZING. I love the whole idea of taco pizza. I am going to make this for me and the kids one day! My oldest is like me and loves taco themed foods too. I love taco pizza…. This looks amazing!!!! I am pinning this goodness! Yum! This looks absolutely delicious! 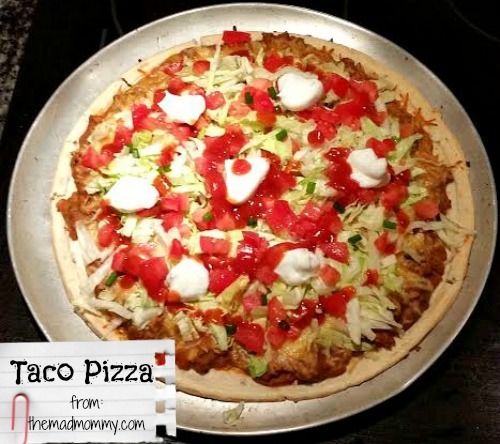 I’ve never had a Taco Pizza, but I am pinning this recipe for later! My kids love pizza and tacos. This looks like it would be a home run for them! Thanks for sharing! Oh, this sounds so yummy! Tacos + Pizza = What’s not to love?!?! I am super hungry now. That looks good! I like Mexican pizza, so I’m sure I’d love this! Yummy! Yes, I love both tacos and pizza!! And together? Brilliant. Thanks for the awesome idea. This looks awesome. I never thought of a taco pizza before but sounds great now that I seen your picture. I would try it! Oh my goodness that looks amazing!! We used to make this quite often I am going to have to put this back on the meal plan rotation. Yum! I hadn’t ever thought of doing tacos as pizzas before. Thanks for sharing! My mom used to make this when we were kids. I so love this, I haven’t eaten it so long, I need to be making this soon though! Yummers! This sounds like an amazing taco pizza recipe for sure. My family and I love tacos as well as pizza so this recipe is perfect for us. I can’t wait to try this indeed. Thanks for sharing. 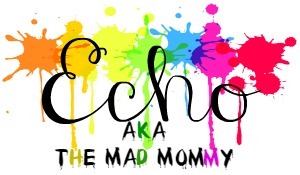 oh Echo you are so naughty! I have attempted taco pizza and failed. so glad to have a successful recipe at last! nom nom nom! Yum, we love pizza and tacos but I never tried this. Sounds great! Pinned to our Small Victories Sunday Linkup board. Yummy! Thanks so much for coming by the #HomeMattersParty – we hope to see you again next week! I’m totally starving right now, and this is making my tummy talk 🙂 My babies love tacos and pizza — why on earth haven’t I put the two together? They love the taco pizza at this Mexicanish restaurant here, and I keep forgetting to try it here at home, thank you for the reminder! Such a great idea – my kids would love this! Thanks for linking up with the Creative Spark Link Party!